In this essay we consider the opportunities that exist for what might be termed conversational design curatorship at RMIT Design Hub. Open since February 2013, this purpose-built, 10-storey building by Sean Godsell Architects, in Association with Peddle Thorp, represents the largest, publicly accessible design-focused space in Australia. With programmable zones and surfaces spread throughout the building, Design Hub is intended to operate less like a traditional gallery and more with the intensity of a studio environment, and predominately presents work in progress. Here our remit for the Design Hub is aligned with the critical aims of CUSP: Designing into the Next Decade as it focuses on the practice of designers who share a vision for something beyond the immediacy of individual practice and a desire to highlight the value to be found in design’s exploratory processes. In this way, CUSP moves within a similar orbit. At Design Hub, we want to amplify design thinking and design research that sees a trans-disciplinary approach as the most effective way of positively shaping our future. Our tactic of a conversational curatorial practice at Design Hub has parallel intent with CUSP’s arms-open approach; its associated online environment, its lengthy and highly inclusive curatorial development phase and its suite of public programs which all reflect the multiple vantage points from which it was initiated. Most critically, in thinking about CUSP as an exercise in cracking open the process of each of the exhibitors, we find a productive leaping off point for a discussion around understanding how we, as the Design Hub Curators, want to tackle the concept of ‘undoing’ so as to understand the practice of doing, of making design. To think of about this another way, we want to use our practices to critically reflect on our container – the Design Hub itself – so as to understand ‘the contained’ – the research and researchers from a diverse range of design disciples, and the exhibitions and programs that exist within. Crucially, we aim to be mindful that this cohabitation of designers and the presentation of design from both within and outside the University distinguish the Hub from other places. Curatorial practice in the visual arts has undergone what has been described as an ‘educational turn’ as it explores the collective unpacking of what we find programmed within our galleries and museums and posits discussions, talks, symposia, debates and public conversations as the main event, where historically they were at the periphery, secondary to the exhibition they supported. Paul O’Neil and Mick Wilson, in their collection of essays entitled ‘Curating and the Educational Turn’, have called this the ‘curatorialisation’ of education whereby the educative process often becomes the object of curatorial production. These discursive elements are framed in terms of education, research, knowledge production and learning – all highly relevant concepts at Design Hub that is charged with being a productively active, messy, doing-place. In light of this, we are keen to ‘perform the building’ and use the program as a social medium that is not just about the presentation of research, but about its contextualization and its mediation. Curatorially, a process-driven program, means rethinking beyond the traditional exhibition: rather than the poster, the object on a plinth, the image on the wall – what about the workshop, performance, field trip, walk, listening exercise, collective bike ride, factory visit, Skype conversation, pin-up crit, reading or an exchange over a meal? Indeed, curating design research projects at Design Hub means curating in-progress works as the life of a research project is largely about the incomplete, about prototyping, experimentation, failures and successes. This is where an active audience – who are consciously engaged with a program and who are encouraged to question and discuss what they experience – makes the act of exhibiting a valuable and useful undertaking for designers. For audiences, the mediated presentation of work in progress provides an opportunity to chew over new thinking that has been dissembled into accessible slices. They can be part of an experience-as-testing-site. As mediator-translators for the design research at Design Hub we take up this role as adaptive inside-outsiders: we are not architects or aerospace engineers although we have a specialized curatorial practice in design which – by its very nature – is different from that of art. Part of our curatorial role, then, is about developing dialogue and mutual trust between researchers from a diverse range of practices, ourselves as curators and our audience. Trust that Design Hub is an open and collective community and a place of ideas and exchange. We all have to risk potential exposure as we reveal ideas in the making when we meet. The task seems to be, how do we encourage engagement, with empathy and a non-exclusive idea of being on the “inside” of specialist knowledge. How do we mediate and expose the process of the designer and create a situation where audiences and experts “tune in” to one another for moments of encounter, exchange and constructive critique. We will briefly explore this through two case studies of recently produced exhibitions at Design Hub – Public Offer – Ways to Share Design. Pin. Like. Print. Post and Las Vegas Studio: Images From The Archives of Robert Venturi And Denise Scott Brown. In these examples we have taken an international touring exhibition of design works as a starting point to curate a local response around, into or on top of them. We have sought to ‘value add’ these globally-produced bodies of research so as bring local context to international practice – to converse with other curators, designers and modes of exhibiting. Co-curated with Timothy Moore, Public Offer was the inaugural exhibition at Design Hub and aggregated design publishing in Melbourne over the last 60-odd years. It included both printed and online publications and featured commercial mainstream, academic and independent and alternative titles. It proposed that the sharing and broadcasting of value is made by designers as a social projection, a proposition that says ‘We have something to say: Is anyone listening?’ The exhibition collated serial, even if irregular or thwarted publishing efforts (where in some cases only one issue was ever produced). The net effect was to see, hear and feel how publishing, and the people who publish, have shaped the broader conversation about this city, its design culture and issues beyond. Public Offer was co-located with the international touring exhibition Archizines curated by Elias Redstone which brought together ninety architecture-focused publications from more than twenty countries. 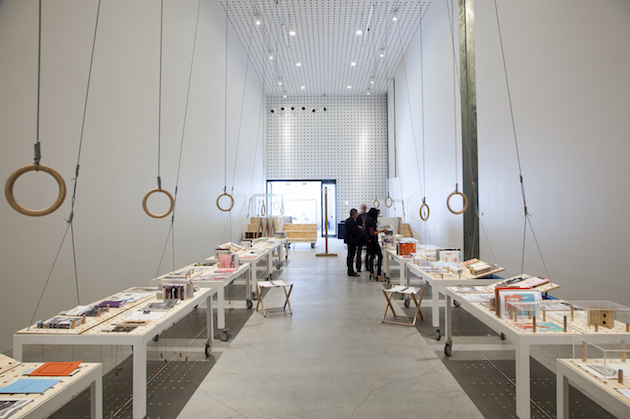 These contemporary magazines, pamphlets, fanzines and journals faced off with the publications in Public Offer in an exhibition designed by SIBLING to reflect a kind of hyper socialized sports area. The timber bleacher–style seating, netball / badminton / basketball court set up and an open workshop / print shop zone where designers took up residence to make within this exhibition about making, to ‘crack open’ aspects of how a publication is put together and to encourage visitors to create, critique and experiment too. Each of these features attempted to encourage a conversational and at times even physical engagement with the exhibition – between exhibitors and visitors and between visitors themselves. All the publications, or their makers, lived or now live in Melbourne, thus collecting the makers in a ‘people archive’ was essential to Public Offer. 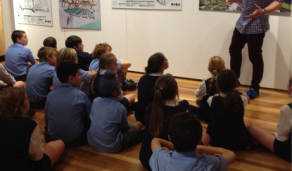 The assembled material in the exhibition was unpacked through several voices which also became additional audio guides. These personal narratives were accompanied by a program of public activities including sports, evening drinks, roundtables, coffee breaks, beamer presentations and talks that recreate the communal space vital for an exchange of ideas inherent to the point of the publications at the centre of the exhibition itself. The touring exhibition Las Vegas Studio: Images from the Archives of Robert Venturi and Denise Scott Brown, curated by Hilar Stadler and Martino Stierli, presented the archival images and films that were produced during the renowned Learning from Las Vegas research studio and the resulting book published in 1972. Learning from Las Vegas was the defining text to pre-empt the post-modern era and a “rhetorical thunderbolt” for a generation of young architects searching for a release from the rigours of Modernism. It is no surprise that within an Australia context, the work of Venturi and Scott Brown, arguably, resonated most strongly in Melbourne and, influenced a generation of young architects whom went on to drive an ideology that is still thriving and present today. 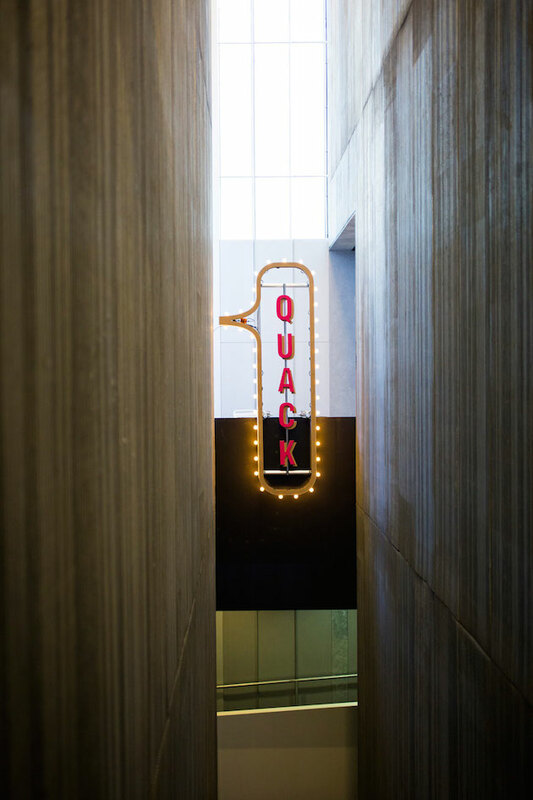 At Design Hub, the opportunity of the exhibition lay with the intent to expose the local stories that had previously been undocumented or at, least, only known anecdotally within a very insular circle. Much in the way a film director may shed new light on a particular period in history via a highly personalised yet compelling narrative, here, the curator takes on the role of ‘story teller’ to expose new associations and slice through the larger historical context. This was achieved via a number of strategies: Firstly within the commissioning of Searle X Waldron Architecture for the exhibition design – in itself an exhibit of full-scale. 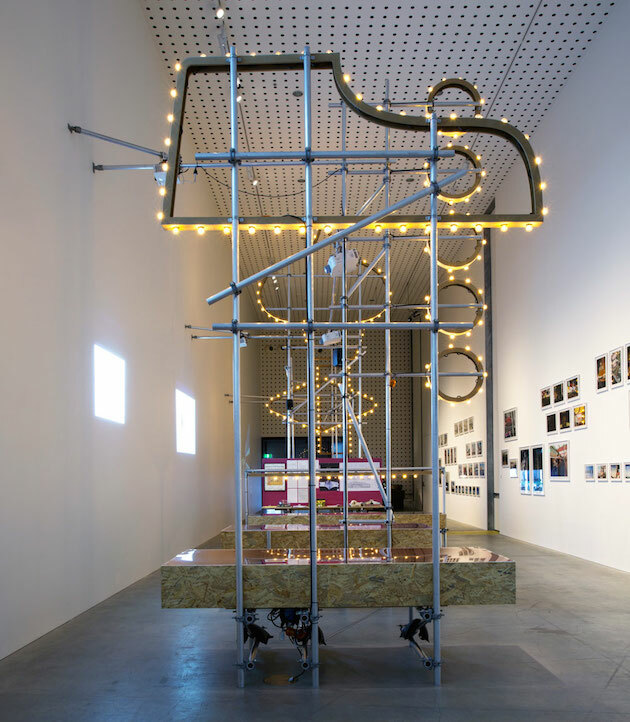 By testing slogans and phrases within the Las Vegas text, the scale and materiality of the exhibition design echoes the ordinary and cheap vs phenomena and veneer with liberal use of scaffolding, OSB board, flickering lights, thin decorative felt and plastic veneers. Secondly via the commissioning of a series of films by Nevegna Reed that framed the context through six specific ‘voices’ – Peter Corrigan, Corbett Lyon, Ian McDougall and Howard Raggatt, Leon van Schaik, Debbie Lyn Ryan Rob McBride, Conrad Hamann. Within the exhibition, the films acted as installation and soundscape – projected in multiple scales across the expanse of white wall and with the conversations filling the expanse of the gallery room. Thirdly, using a series of objects loaned by each interviewee, of mostly non-precious yet original and previously unseen. Original letters, sketchbooks, collages, keepsakes, photographs, prints and drawings – the process materials that passed through the hands of these designers in the making of projects, schemes, manifestos, publications. Along with a program of talks and debates that ran alongside the exhibition, these assembled objects drew out the ideas that ignited the imaginations of many of this city’s most influential architects. For RMIT Design Hub, the critical aspect of the show was that it demonstrated clearly design research as an integral underpinning to architectural practice and that careful observation and application of knowledge are key drivers for the production and dissemination of ideas. In addition, Design Hub seizes the opportunity to situate design practice in Australia as a compelling contributor to global architectural discourse. Our first year at RMIT Design Hub has been a time of experimentation and discovery, reflection and development. We are continuing to learn more about our building, the parameters of design research, how to encourage collaborative interaction between practitioners and an engagement with an active audience at Design Hub, while investigating new ways to program our diverse and challenging spaces. New global challenges require new design research methods and collaborative frameworks that, in turn, demand an expanded way of thinking, talking, discussing and presenting design. If we aspire to discuss design beyond a focus on form or fashion then we need to invite audiences into focused, interactive and mediated experiences that communicate design as a vital and active leader of our future and, in order to do so, we need to curate design ideas in compelling and inventive ways. 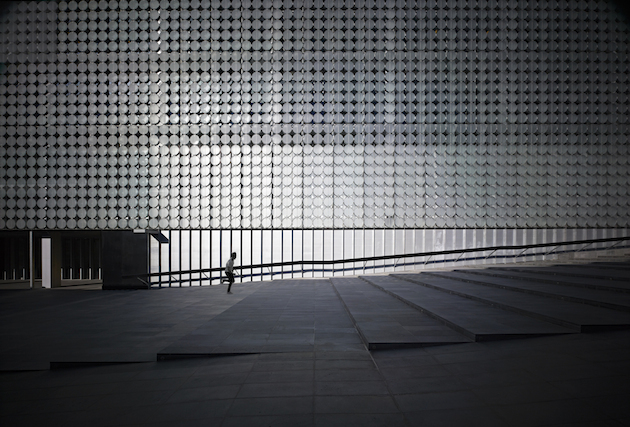 Images: RMIT Design Hub by Sean Godsell, photograph: Earl Carter. Public offer: Ways to Share Design exhibition photography. Las Vegas Studio: Images from the Archives of Robert Venturi and Denise Scott Brown exhibition photography, photograph: Tobias Titz.